Kitchen is one of the most important areas of your home. Here you can create mouth-watering dishes, share time with your family or gather around for do-it-yourself projects with your kids. If your counter surfaces seem to be outdated the place becomes stagnant and uninviting. Sometimes a simple renovation can give it a completely new look. Some essential things that you need to consider at the time of upgrading your counters include – choosing the right design and color of the cabinets, selecting your new countertops and making sure everything will match with the overall interior of your kitchen. 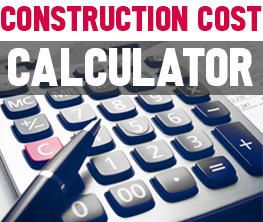 It is also important to consider your estimated budget within which you want to complete kitchen renovation. The picture was taken from Caesarstone Canada Official site. Explore the Visualizer to try different finishes for your kitchen. The picture was taken from Caesarstone Canada Official site. The picture was taken from Caesarstone Canada Official site. Finishes of your countertops and furniture have to complement with the color of the kitchen walls. • More members in the family – This is one vital reason why you may require certain alterations of the kitchen space. Since there were fewer members in the family in the past, everyone could enjoy food together. But with new members joining the family you will have to update the kitchen to make accommodation comfortable for everyone. Make necessary seating arrangements and add needed counter top surface can make things more convenient and enjoyable. A new quartz kitchen island can be a great idea in this situation! Sometimes even this small change can make your kitchen more useful for other kinds of family activities. The picture was taken from Caesarstone Canada Official site. Adding a kitchen island can bring more work surface for your family to enjoy do-it-yourself projects. • Old-fashioned kitchen style – This is another reason why you may want to remodel. No one likes an outdated kitchen with old tile, pilling off paint and splatters of grease on walls. It may have looked good in 70th to have tile on your cooking surface but it’s time to move on! With any kitchen renovation you can still go with a more traditional style but incorporate modern equipment and the latest technology that can be essential for cooking more efficiently.Take a look at this quartz kitchen island collection for more inspirations. The picture was taken from Caesarstone Canada Official site.. Good lighting will highlight your new finishes in the kitchen. • Outdated countertops – If your current countertop is cracked or is not in good condition, you may want to consider replacing it with something fresh. 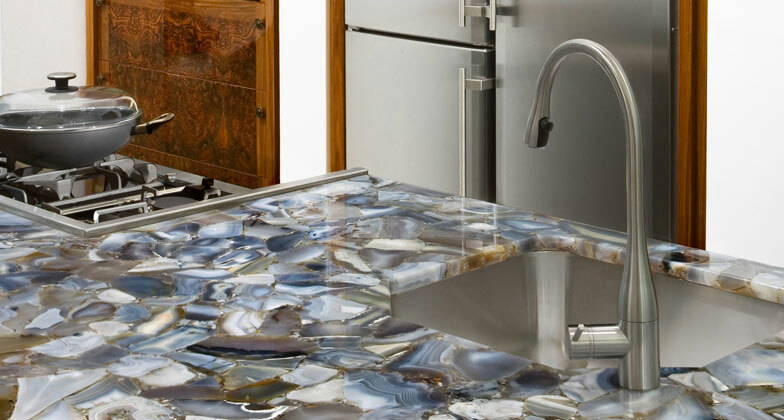 Some of the most popular countertops used in modern kitchens are granite, marble, quartz and concrete. Caesarstone offers a variety of options for countertops on all your kitchen remodeling project. Our clients selected Caesarstone because of the wide variety you can pick from and the quality of the product. • Increase worth of your property – Home remodel is an important project and must be handled with proper care. When planning your kitchen renovation you need to add necessary items in the space to dd value to your property in case you want to sell your home later in life. Updating your kitchen can help a lot in any kitchen remodeling project. But selecting proper materials is the key. Quality stone will last and look good for years. In conclusion, if you are thinking to renovate your kitchen Caesarstone countertop selection will make your space look unique. By taking into consideration some great kitchen island ideas, you can add stunning beauty and impeccable functionality to your cooking space and enjoy delicious food with your family. 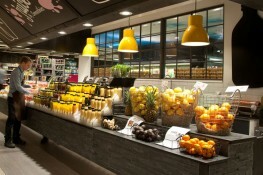 Just a note: Caesarstone also provides wonderful countertop collection for commercial interior designers. 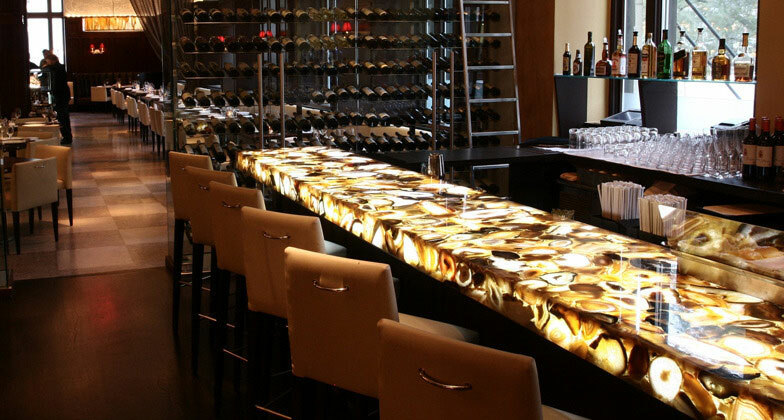 Brown Agate (image below) is my favorite stone which can be back lit for a more dramatic effect like you can see in this bar and restaurant interior design. Please take a look at our Before and After images of selected Mindful Design Consulting projects from 2015 HERE.